I decided that my first trip of the new year was going to be to Iceland. A while ago, I had done some research on the country and found that between November and March is the best time to see the Northern Lights. So mid-January, I and my friend, Mary-Beth (who was also an American studying abroad at Edinburgh) set out for Reykjavik, the world’s most northern capital, on the east coast of Iceland. I arrived a day before Mary-Beth and at night because to actually get from Edinburgh to Reykjavik took 13 hours. In order to save money, I had to first fly down to London before flying back up to Iceland. So after two flights, four buses, one taxi and a few layovers, I arrived very exhausted. I got to Iceland in the evening and had to find the house of a woman I had never met, but was going to be staying with for the next few days. This was my first experience Couch Surfing, a growing practice of connecting with people around the world through the website and making arrangements to crash on their couch while visiting their country. You can be either a host or a surfer (or both) and either way, it is a wonderful way to meet people who would have never connected with in the first place. I had messaged Gudlaug (Gulla for short), an Icelandic woman whose profile seemed interesting and trustworthy. She agreed to host Mary-Beth and myself and so Wednesday night, I found her place and was greeted by unlocked doors and a post-it on her door welcoming me. I entered her home and found it...empty. I wasn't sure quite what to do, in new country, in a strangers home, late at night, alone. Well, I was a couch surfer after all...so I went and sat on her couch. There were a couple very curious and friendly cats, so I pet them until her sons came in, running late to greet me. I talked with them until Gulla got home from work. For my first couch surfing experience, I could not have asked for a better host. Gulla was laid-back, generous, and very friendly. She had mentioned that the night I arrived there was a get-together for fellow couch surfers in Reykjavik that she was attending. So, tired as I was, I joined her and was able to get a glimpse of the city as we walked through it to the pub where the meeting was. It was very much fun to meet and chat with other couch surfers (most of whom were hosts) and get a local perspective of Icelandic tourism. About one in the morning, Gulla and I headed home, joined by her other surfer (yes, she’s a super-host! ), a nice Swedish girl named Ingela. I was finally able to enjoy the full comfort of a cozy couch, complete with the Icelandic kitties. It really blew me away how normal it seemed to have a giant ice-covered mountain just right across the harbor. As I walked around for the rest of the day, I kept running into similar sights…one of the many things that made sure I didn’t forget I was in Iceland. I found Reykjavik as a city to be fairly unimpressive in comparison to other European cities. The architecture was simple and homely, consisting mostly of low wooden buildings and grey sidewalks. However, the people were friendly and I have to admit that every time I saw a particularly burly, wild-haired man who looked just like a Viking, it made me happy inside. Everyone was wearing fur and the gift shops displayed fox skins, real fur hats and gloves and pelts ranging from reindeer to seals. One even advertised that you could special order a polar bear pelt. I suppose that was the biggest culture shock, seeing dead animals stuffed in nearly every window display of every shop and being worn by the majority of people on the street. I also passed by a restaurant advertising their special –a whale peppersteak. I personally did not partake in the fur fetish, being quite satisfied with the faux fur that lines my own coat. During my first full day, I explored the city’s old cemetery, a far-removed magical place, nestled with its four stone walls. All the gravestones were clustered together, between trees and rocks and everything was covered in a sparkling white snow. My favorite tombstone was one that had been mounted on a tree trunk. From there I wandered aimlessly around town, finding myself in the industrial harbor of the city before following the streets back into the city centre. I visited the city hall, a large gray building that would not be unique except for the fact it is built over a lake. Its supports are hidden under the water and it looked like it was resting softly on the ice. From the side of the hall, there are pumps are spout out warm water, melting the ice and giving the local fowl an area to swim around and honk noisily as they flock in the hundreds. On Friday, after Mary-Beth had arrived late the night before, we explored Reykjavik a bit more then caught a bus tour we had signed up for. I‘m not usually one for touristy bus tours, but as Iceland is pretty tricky to get around, especially in the snow, it seemed like a good way to see the surrounding natural areas. This one took us out of the city and towards the west, into the snow-covered landscape that surrounded the small bits of civilization. Our first stop was at a UNESCO World Heritage site, a giant rift valley that had hosted the world’s first parliament when the Vikings were settled in Iceland. The rifts had been created by the ever-shifting plate tectonics smashing together and breaking apart. We walked through one, plodding along through the thick snow and cold wind observing our beautiful surroundings and being able to look out and see natural steam billowing up from the earth on the horizon. Many of the smaller rifts were filled with water and looked so serene and still that it seemed unreal. Once we had boarded the bus again, our driver informed us that although we were currently on the American plate tectonic, we were about to cross over to the European plate through a no man’s land. It was weird thinking that for a little bit, we technically weren’t on any continent at all. Driving on, we watched the frozen tundra blur by, occasionally speckled with the very furry and native Icelandic ponies. After an hour or so, we came to Gulfoss, an enormous waterfall that we had to disembark and walk down a long path to get to. This whole walking thing was a challenge because it was freezing. Seriously, I was wearing my thickest coat and clothes and was probably the coldest I’ve ever been in my life. But Mary Beth and I, huddled like sheep, were able to brave the wind and snow and found ourselves on cliffs right next to the waterfall. It gushed over ice and rock in majestic sheets of green and blue, filling the air with white spray that pricked at the skin like tiny pins. After spending as must time as we could muster staring in awe at the waterfall and man-sized icicles that covered the cliffs, Mary Beth and I hoofed it back up the path and into the restaurant and gift shop for a huge hot meal fit for a Viking (lamb stew, carrot cake, and hot chocolate). It was very fulfilling. After Gulfoss, we headed up the road where several geysers (correct pronunciation of this Icelandic word; “gay-sir”) rested uneasily below the earth’s surface. Like giant boiling jacuzzis, they simmered impatiently, smelling of rotten eggs and emitting steam of the same fragrance. We stood by one and waited for it to erupt, and after about ten minutes, were rewarded for our patience. The giant burst scared the crap of out me, but was awesome to see and a wonderful way to end the tour and our day. On Saturday, Mary Beth and I walked around the city for a while, found a local flea market with all sorts of weird fish, then decided to catch a bus to the Blue Lagoon. 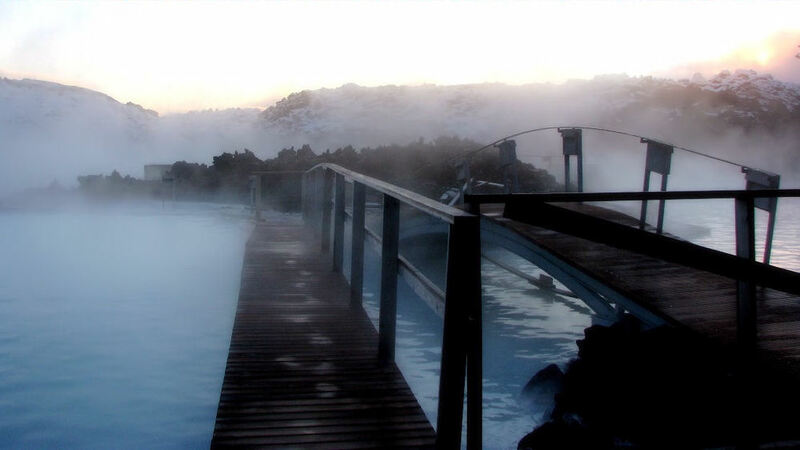 The Blue Lagoon is a natural thermal hot spring that has been made the center of a beautiful spa. Though admittedly aimed more at tourists than locals, everyone still visits at least once and oh god….it is amazing. You first enter though the main building that seems like it was built right into the rocks and sign in. We opted to pay a tiny bit extra and get a massage to go with our hot spring soaking experience. From there, you go into the locker rooms, change into swim suits, shower and then enter through glass doors into the lagoon. Surrounded by snow covered rocks, the lagoon is a cloudy blue and though you know there must be a lot of people in it, there is so much steam that you are hardly aware of them. It was very cold walking out into the Icelandic air with nothing but a swim suit on, but once I slipped into the soft waters of the lagoon, I was in heaven on earth. The bottom is natural, soft with silica mud (of which they also provide buckets so that you can smear it on your face) and small round rocks. The lagoon is quite large, with different sections and alcoves to relax in. On one end, there is a waterfall that you can stand under and receive a rough but amazing massage sensation. And speaking of massages, our professional ones were incredible. They had roped off a section of the lagoon and gave full body massages in the water. After having warm oil rubbed on you, the massage therapist would slide you onto a thin floating mattress (face up) and stand next to you, giving the most amazing massage. She would move the mattress around so that the warm flowed around and over and push it down to reach your back. Once the massage was over, she wrapped you in a warm towel and left you floating on the mattress, just staring up at the sky and steam in complete contentment, with your brain turned to wonderful mush from the sheer relaxation of it all. So in other words, I recommend the Blue Lagoon to anyone. We spent five hours in there, getting out only to reluctantly catch the last bus home. It was the perfect end to my visit to Iceland and though my entire stay was short, I will never forget the majestic and stunning sights of the shifting landscape, the biting cold of the unforgiving wind, nor the utter bliss of the hot springs.